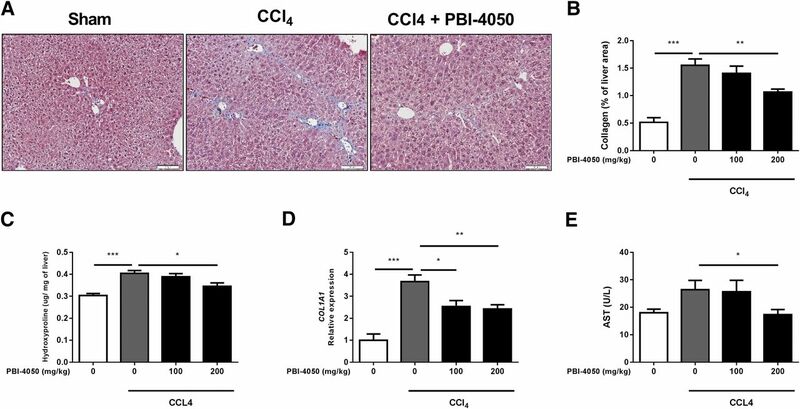 PBI-4050 reduces CCl4-induced liver fibrosis. (a) Representative histologic images of liver sections stained with Masson’s trichrome of sham, CCl4-, or CCl4- and PBI-4050 (200 mg/kg)–treated mice. (b) Quantification of Masson’s trichrome stain of liver collagen deposition. (c) Hydroxyproline levels in liver tissue. (d and e) Hepatic collagen I mRNA expression assessed by qPCR (D) and AST serum levels (e). Column bar graphs represent the mean ± S.E.M. (sham, n = 4; 100 or 200 mg/kg CCl4 and 100 or 200 mg/kg CCl4 + PBI-4050, n = 10 each). *P < 0.05; **P < 0.01; ***P < 0.001, by one-way analysis of variance. Scale bar, 100 µm. 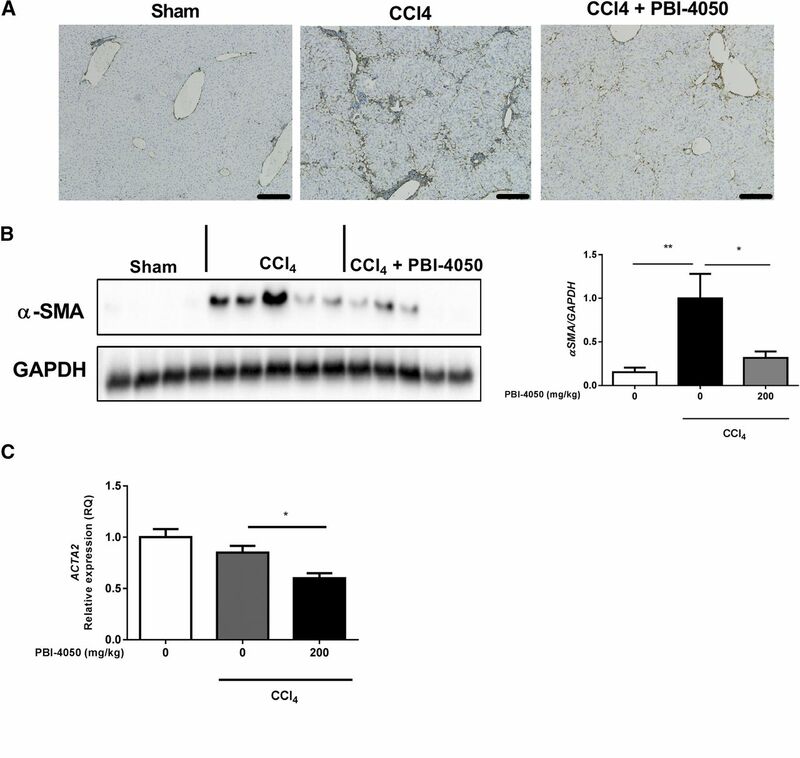 PBI-4050 reduces hepatic α-SMA in a CCl4-induced liver fibrosis model. (a) Representative immunohistochemical staining of α-SMA in liver sections. (b) Representative Western blot and densitometry analysis of α-SMA levels in liver lysates. (c) Hepatic α-SMA mRNA expression in liver tissue extracts. Column bar graphs represent the mean ± S.E.M. (sham, n = 4; 200 mg/kg CCl4 and 200 mg/kg CCl4 + PBI-4050, n = 10 each). *P < 0.05; **P < 0.01, by one-way analysis of variance. Scale bar, 200 µm. Effect of PBI-4050 on expression of fibrosis and oxidative stress markers and receptors in liver tissue. (a–f) Hepatic mRNA expression of MMP2 (a), TIMP-1 (b), Snail1 (c), iNOS (Nos2) (d), PPARγ (e), and GPR84 (f) assessed by qPCR. Data represent the mean ± S.E.M. (sham, n = 4; 100 or 200 mg/kg CCl4 and 100 or 200 mg/kg CCl4 + PBI-4050, n = 10 each). *P < 0.05; **P < 0.01; ***P < 0.001, by one-way analysis of variance. 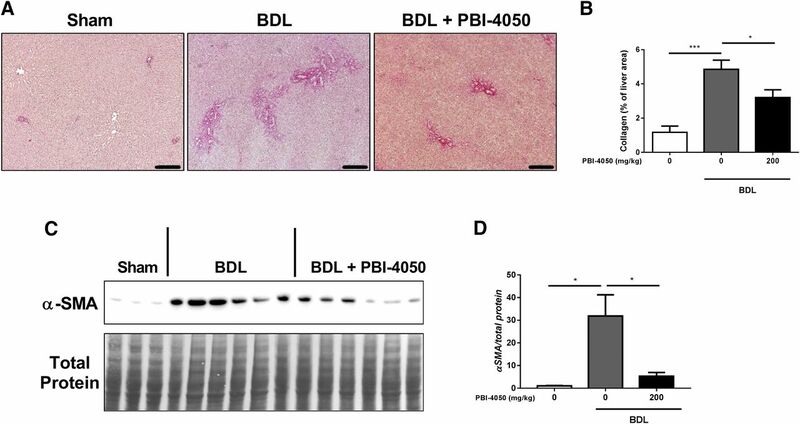 PBI-4050 reduces BDL-induced hepatic fibrosis in rats. (a) Representative histologic images of liver sections stained with Sirius red. (b) Digital image analysis of liver fibrosis area. (c and d) Western blot (c) and densitometry (d) analysis of α-SMA levels in liver lysates (sham, n = 5; BDL, n = 7; BDL + PBI-4050, n = 6). *p < 0.05; *P < 0.05; **P < 0.01; ***p < 0.001 by one-way analysis of variance. Scale bar, 200 µm. Antiproliferative effect of PBI-4050 on activated HSCs. (a) Cell proliferation of HSCs treated for 24 hours with 10 ng/ml TGF-β1 and 250 or 500 µM PBI-4050 was assessed by Resazurin reduction at 0 and 24 hours. Results are the mean ± S.E.M. of three independent experiments. *p < 0.05; *P < 0.05; ***P < 0.001, by one-way analysis of variance. (b) HSCs were treated as described above and the cell cycle was analyzed by flow cytometry. Percentages of cells in the G0/G1, S, G2/M, and apoptosis phases of the cell cycle are shown. 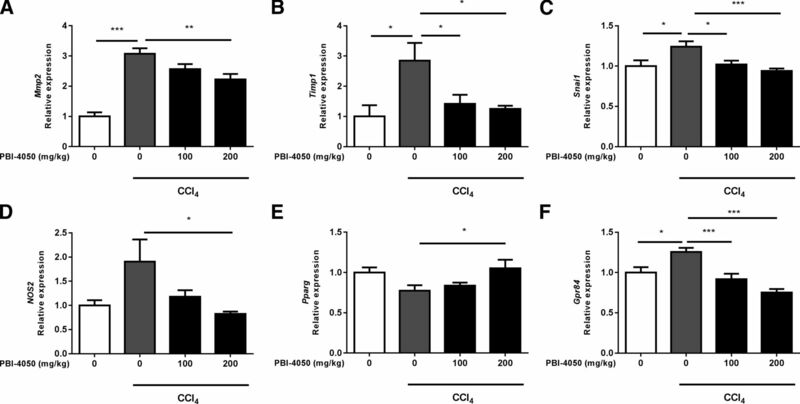 PBI-4050 abrogates fibrogenic markers in activated HSCs. (a) mRNA expression of activated stellate cell markers α-SMA, profibrotic marker CTGF, and PPARγ were determined in TGF-β1–stimulated HSCs treated with 250 or 500 µM PBI-4050 for 24 hours. (b) Representative Western blot and densitometry analysis of α-SMA protein levels. (c) Secreted protein levels of profibrotic CTGF were measured in the cell supernatant by an enzyme-linked immunosorbent assay. Data represent the mean ± S.E.M. of three independent experiments. *p < 0.05; **p < 0.01; ***p < 0.001; **P < 0.01; ***P < 0.001, by one-way analysis of variance. 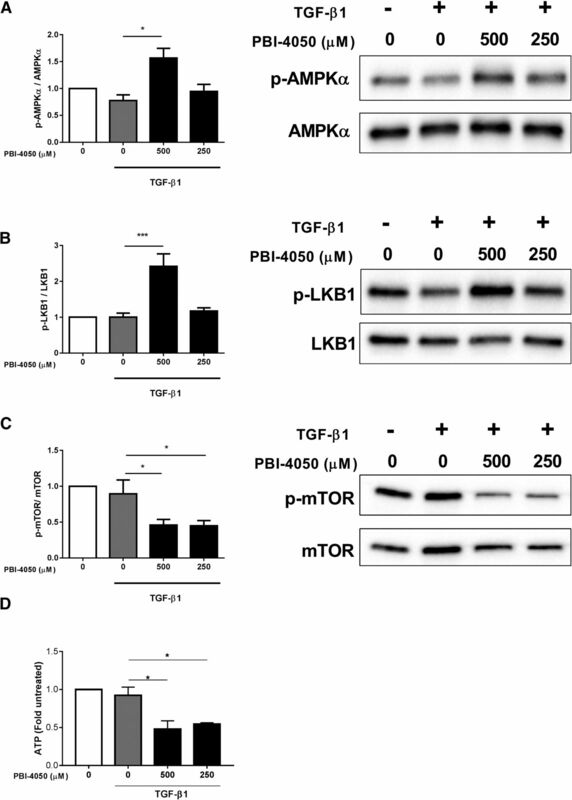 PBI-4050 increases AMPK and LKB1 phosphorylation and inhibits mTOR activation and intracellular ATP levels in HSCs. HSCs were treated for 24 hours with TGF-β1 (10 ng/ml) in the presence or absence of PBI-4050. (a–c) Western blot analysis was performed to quantify total and phosphorylated (p) AMPK (a), LKB1 (b), and mTOR (c) protein levels. Ratios of p-AMPKα/AMPK, p-LKB1/LKB1, and p-mTOR/mTOR were determined. (d) Intracellular ATP levels. Column bar graphs represent the mean ± S.E.M. of three independent experiments. *p < 0.05; ***p < 0.001; *P < 0.05; **P < 0.01; ***P < 0.001, by one-way analysis of variance. 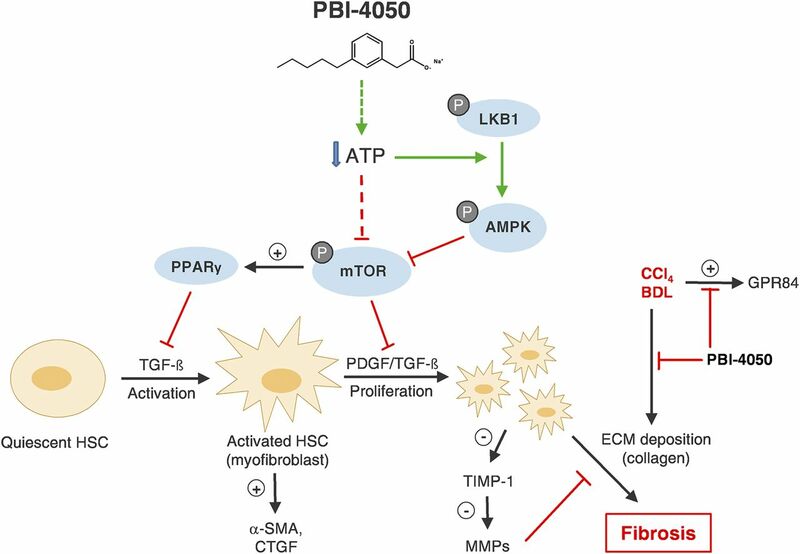 A schematic representation showing the protective effect of PBI-4050 on hepatic fibrosis. PBI-4050 decreases intracellular ATP levels and activates LKB1, one of the upstream kinases phosphorylating AMPK. In turn, activated AMPK and low ATP levels can inhibit the cell growth master regulator mTOR and thereby restore PPARγ expression, leading to inhibition of HSC activation and proliferation. Consequently, fibrotic and remodeling markers are decreased by PBI-4050, resulting in improvement of hepatic fibrosis.